Sinningia ‘Fernwood’s Cherry Soda’, 2011, IR111179, Lee Stradley, NY. (S. ‘Black Light’ x self), Cross made Sept. 2010, planted Nov. 2010 and first flowered Mar. 2011. Fertile but reproducible only vegetatively. Tuberous, upright rosette. Leaves green, 2 in. long x 2 in. wide, orbicular with crenate margin, acute tip and cordate base. Calyx split, green, 0.25 in. long, Pedicel 0.75 in. with 2 flowers per leaf axil. Corolla salverform, 1 in. long x 1 in. 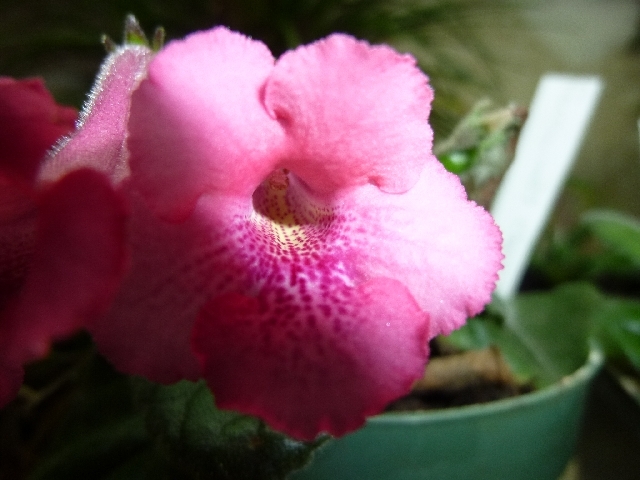 wide, medium reddish pink with darker spots and lines on lower three petals, yellow throat.